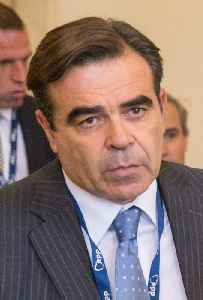 Margaritis Schinas is the current Chief Spokesperson of the European Commission, and a Deputy Director-General at the Commission's DG Communication. He has in his life been a politician and European Union civil servant. He served as Member of the European Parliament for the New Democracy Party of Greece from 2007 to 2009. In 2010, he was appointed Deputy Director of the Bureau of European Policy Advisers by Commission President José Manuel Barroso.